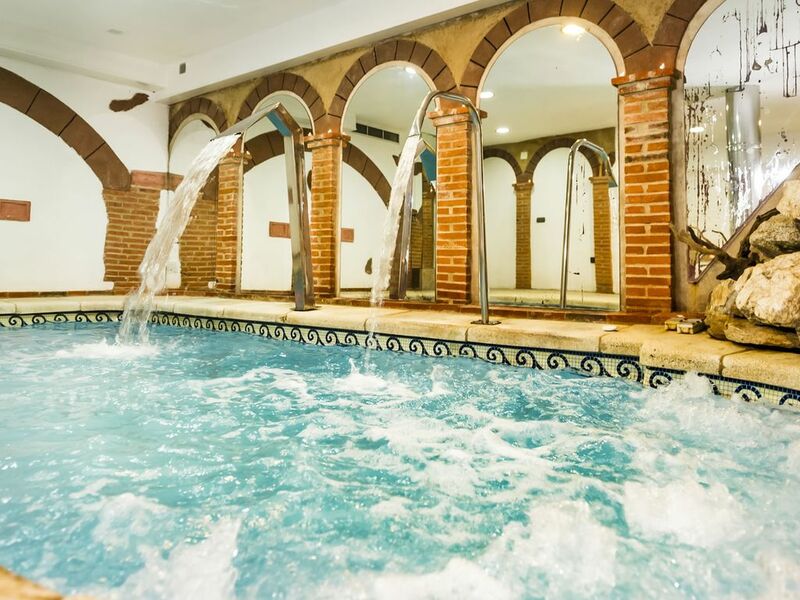 Luxury Country House with private Spa 5 minutes from Salamanca. 5 minutes from Salamanca, ideal to visit Salamanca and enjoy the house. Casa Rural La Chirumba, accommodation cataloged with 4 stars, is a penthouse-attic with all the modern comforts to make your stay as comfortable as possible. The house consists of 2 double rooms and two triple rooms, one with bathroom, modern kitchen with all appliances, bathroom with Jacuzzi and giant shower and toilet with giant shower. In addition, the house has a cellar of 80 square meters with barbecue and wood oven, complete rustic kitchen, faucets of reverse osmosis for cooking and drinking, and a projector with screen. The accommodation has a Spa with heated pool with Jacuzzi, chromotherapy, waterfall and jets, Turkish bath with chromotherapy and aromatherapy, shower nebulized and sharp jets. Outside there is a terrace of 22 meters, with outdoor furniture. It is a house domotizada for the total control of temperatures, lights, blinds, scenes, etc. The accommodation is fully air-conditioned through underfloor heating-cooling. • Batuecas and Sierra de Francia. We invite you to discover Salamanca. If you have never come, be prepared to be surprised; If you already know her, let yourself be amazed once more. A cheerful, university and lively city awaits you. It is the diversity of people: students, tourists and Salamanca themselves, one of its main attributes, and it is they who give the city a nice atmosphere, fresh and young. The city is always open, ready to welcome and deliver the wealth of its heritage, its culture and its gastronomy. The city is a World Heritage Site, and has many corners and historic buildings; all of them are concentrated in the historic center, so the visit must be made on foot. The sunrise and sunset are magical moments. Light transforms the interior and the exterior; a single glow bathes the golden facades and, the characters that have passed through the city throughout its history, are present.